Implements image masking operation constrained by a polyline on a plane perpendicular to certain viewing direction. This class is parameterized over the types of the input image, polyline, vector and output image. Definition at line 37 of file itkPolylineMaskImageFilter.h. Definition at line 44 of file itkPolylineMaskImageFilter.h. 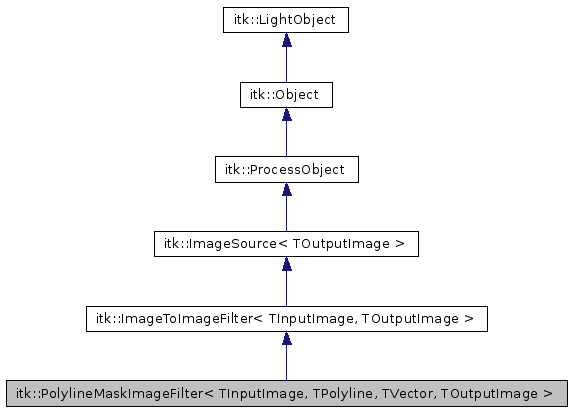 Reimplemented in itk::HistogramMatchingImageFilter< TInputImage, TOutputImage, THistogramMeasurement >, itk::ImagePCAShapeModelEstimator< TInputImage, TOutputImage >, itk::IsolatedWatershedImageFilter< TInputImage, TOutputImage >, itk::KLMRegionGrowImageFilter< TInputImage, TOutputImage >, itk::MRFImageFilter< TInputImage, TClassifiedImage >, itk::MultiResolutionPyramidImageFilter< TInputImage, TOutputImage >, itk::RecursiveMultiResolutionPyramidImageFilter< TInputImage, TOutputImage >, itk::RegionGrowImageFilter< TInputImage, TOutputImage >, itk::RGBGibbsPriorFilter< TInputImage, TClassifiedImage >, itk::VoronoiSegmentationImageFilterBase< TInputImage, TOutputImage, TBinaryPriorImage >, itk::BinomialBlurImageFilter< TInputImage, TOutputImage >, itk::BlackTopHatImageFilter< TInputImage, TOutputImage, TKernel >, itk::BloxBoundaryPointToCoreAtomImageFilter< dim >, itk::BloxBoundaryProfileImageToBloxCoreAtomImageFilter< TInputImage, TOutputImage, TSourceImage >, itk::BSplineDecompositionImageFilter< TInputImage, TOutputImage >, itk::CheckerBoardImageFilter< TImage >, itk::ClosingByReconstructionImageFilter< TInputImage, TOutputImage, TKernel >, itk::ConnectedThresholdImageFilter< TInputImage, TOutputImage >, itk::FlipImageFilter< TImage >, itk::GradientImageToBloxBoundaryPointImageFilter< TInputImage >, itk::GrayscaleConnectedClosingImageFilter< TInputImage, TOutputImage >, itk::GrayscaleConnectedOpeningImageFilter< TInputImage, TOutputImage >, itk::GrayscaleFillholeImageFilter< TInputImage, TOutputImage >, itk::GrayscaleGrindPeakImageFilter< TInputImage, TOutputImage >, itk::HConcaveImageFilter< TInputImage, TOutputImage >, itk::HConvexImageFilter< TInputImage, TOutputImage >, itk::HMaximaImageFilter< TInputImage, TOutputImage >, itk::HMinimaImageFilter< TInputImage, TOutputImage >, itk::HoughTransform2DCirclesImageFilter< TInputPixelType, TOutputPixelType >, itk::HoughTransform2DLinesImageFilter< TInputPixelType, TOutputPixelType >, itk::InverseDeformationFieldImageFilter< TInputImage, TOutputImage >, itk::IsolatedConnectedImageFilter< TInputImage, TOutputImage >, itk::IterativeInverseDeformationFieldImageFilter< TInputImage, TOutputImage >, itk::MorphologicalGradientImageFilter< TInputImage, TOutputImage, TKernel >, itk::NonThreadedShrinkImageFilter< TInputImage, TOutputImage >, itk::OpeningByReconstructionImageFilter< TInputImage, TOutputImage, TKernel >, itk::OrientImageFilter< TInputImage, TOutputImage >, itk::PolylineMask2DImageFilter< TInputImage, TPolyline, TOutputImage >, itk::RecursiveSeparableImageFilter< TInputImage, TOutputImage >, itk::ResampleImageFilter< TInputImage, TOutputImage, TInterpolatorPrecisionType >, itk::ShrinkImageFilter< TInputImage, TOutputImage >, itk::TobogganImageFilter< TInputImage >, itk::TwoOutputExampleImageFilter< TImage >, itk::VectorResampleImageFilter< TInputImage, TOutputImage, TInterpolatorPrecisionType >, itk::WarpImageFilter< TInputImage, TOutputImage, TDeformationField >, itk::WarpVectorImageFilter< TInputImage, TOutputImage, TDeformationField >, itk::WhiteTopHatImageFilter< TInputImage, TOutputImage, TKernel >, itk::WrapPadImageFilter< TInputImage, TOutputImage >, itk::InPlaceImageFilter< TInputImage, TOutputImage >, itk::SimpleFuzzyConnectednessImageFilterBase< TInputImage, TOutputImage >, itk::AnchorErodeDilateImageFilter< TImage, TKernel, TFunction1, TFunction2 >, itk::AnchorOpenCloseImageFilter< TImage, TKernel, LessThan, GreaterThan, LessEqual, GreaterEqual >, itk::ExponentialDeformationFieldImageFilter< TInputImage, TOutputImage >, itk::MorphologicalWatershedFromMarkersImageFilter< TInputImage, TLabelImage >, itk::MorphologicalWatershedImageFilter< TInputImage, TOutputImage >, itk::BlackTopHatImageFilter< TInputImage, TOutputImage, TKernel >, itk::ResampleImageFilter< TInputImage, TOutputImage, TInterpolatorPrecisionType >, itk::WhiteTopHatImageFilter< TInputImage, TOutputImage, TKernel >, itk::RegionalMaximaImageFilter< TInputImage, TOutputImage >, itk::RegionalMinimaImageFilter< TInputImage, TOutputImage >, itk::ValuedRegionalExtremaImageFilter< TInputImage, TOutputImage, TFunction1, TFunction2 >, itk::VanHerkGilWermanErodeDilateImageFilter< TImage, TKernel, TFunction1 >, itk::VoronoiSegmentationImageFilterBase< TInputImage, TOutputImage >, itk::InPlaceImageFilter< TDeformationField, TDeformationField >, itk::InPlaceImageFilter< TLabelImage, TOutputImage >, itk::InPlaceImageFilter< TInputImage >, itk::InPlaceImageFilter< TInputImage, TSparseOutputImage >, itk::InPlaceImageFilter< TFeatureImageType, Superclass::ImageType >, itk::InPlaceImageFilter< TInputImage1, TOutputImage >, itk::InPlaceImageFilter< TInputImage, itk::Image< TOutputPixelType,::itk::GetImageDimension< TInputImage >::ImageDimension > >, itk::InPlaceImageFilter< TInputImage1, itk::Functor::MakeJoin< TInputImage1, TInputImage2 >::ImageType >, itk::InPlaceImageFilter< itk::Image< TInputPixel1, NDimension >, itk::Image< std::complex< TOutputPixel >, NDimension > >, itk::InPlaceImageFilter< TInputImageType, TSparseOutputImageType >, itk::InPlaceImageFilter< TImage, TImage >, itk::AnchorErodeDilateImageFilter< TImage, TKernel, std::less< TImage::TImage::PixelType >, std::less_equal< TImage::TImage::PixelType > >, itk::AnchorErodeDilateImageFilter< TImage, TKernel, std::greater< TImage::TImage::PixelType >, std::greater_equal< TImage::TImage::PixelType > >, itk::AnchorOpenCloseImageFilter< TImage, TKernel, std::greater< TImage::PixelType >, std::less< TImage::PixelType >, std::greater_equal< TImage::PixelType >, std::less_equal< TImage::PixelType > >, itk::AnchorOpenCloseImageFilter< TImage, TKernel, std::less< TImage::PixelType >, std::greater< TImage::PixelType >, std::less_equal< TImage::PixelType >, std::greater_equal< TImage::PixelType > >, itk::ValuedRegionalExtremaImageFilter< TInputImage, TOutputImage, std::greater< TInputImage::PixelType >, std::greater< TOutputImage::PixelType > >, itk::ValuedRegionalExtremaImageFilter< TInputImage, TOutputImage, std::less< TInputImage::PixelType >, std::less< TOutputImage::PixelType > >, itk::VanHerkGilWermanErodeDilateImageFilter< TImage, TKernel, itk::MinFunctor< TImage::PixelType > >, and itk::VanHerkGilWermanErodeDilateImageFilter< TImage, TKernel, itk::MaxFunctor< TImage::PixelType > >. Definition at line 62 of file itkPolylineMaskImageFilter.h. Definition at line 60 of file itkPolylineMaskImageFilter.h. Definition at line 61 of file itkPolylineMaskImageFilter.h. Definition at line 59 of file itkPolylineMaskImageFilter.h. Standard matrix type for this class. Definition at line 67 of file itkPolylineMaskImageFilter.h. Definition at line 79 of file itkPolylineMaskImageFilter.h. Definition at line 77 of file itkPolylineMaskImageFilter.h. Definition at line 78 of file itkPolylineMaskImageFilter.h. Definition at line 76 of file itkPolylineMaskImageFilter.h. Definition at line 43 of file itkPolylineMaskImageFilter.h. Definition at line 63 of file itkPolylineMaskImageFilter.h. Definition at line 73 of file itkPolylineMaskImageFilter.h. Definition at line 64 of file itkPolylineMaskImageFilter.h. Definition at line 41 of file itkPolylineMaskImageFilter.h. Definition at line 42 of file itkPolylineMaskImageFilter.h. Definition at line 70 of file itkPolylineMaskImageFilter.h. Definition at line 129 of file itkPolylineMaskImageFilter.h.